Tris must escape with Four and go beyond the wall enclosing Chicago. For the first time ever, they will leave the only city and family they have ever known in order to find a peaceful solution for their embroiled city. Once outside, old discoveries are quickly rendered meaningless with the revelation of shocking new truths. Tris and Four must quickly decide who they can trust as a ruthless battle ignites beyond the walls of Chicago which threatens all of the humanity. In order to survive, Tris will be forced to make impossible choices about courage, allegiance, sacrifice, and love. 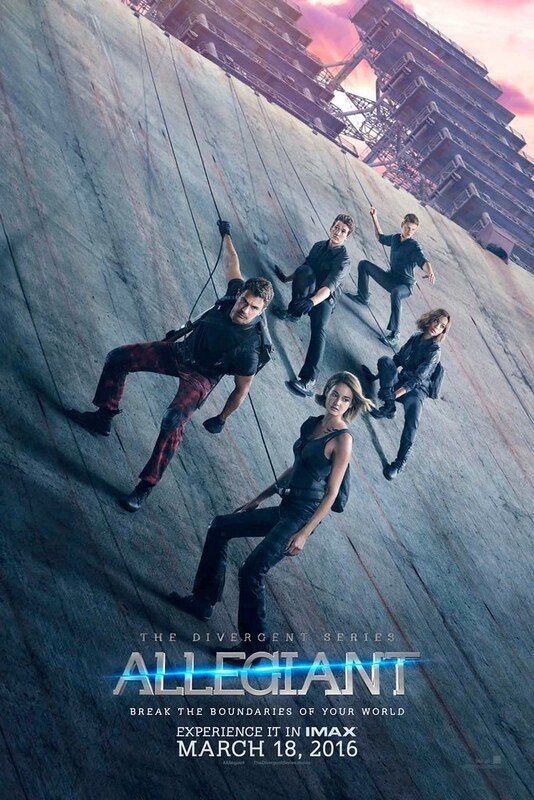 Allegiant is the third film from The Divergent series. I don’t know about you people, but I don’t really like the film. I haven’t read the book either. It’s been sitting on my shelf for awhile, but from film aspect, it’s not really good. It’s weird, I think. At first, in Divergent (2014), I found the story is interesting, with the divided faction based on characters. But now, it’s changing into some kind of genetic experiments. From traditional—kind of—they now made the story with an advanced technology included. I really needed time to process them out. An isolated society with advanced technology, well, talk about weird here. Usually, when you’re isolated, the technology is way more advanced but somehow in Allegiant, it happened otherwise. I just really don’t get it. I can’t compare the film with the book since I haven’t read the book so I don’t know whether the film is still based on the book or the filmmakers have again changed the storyline from the book. I can guess the story of this film pretty easily when Tris and Four arrived at the new place. I think it has been traditional for all dystopian films. New troubles in a new place. Classic, really. I have watched many dystopian films before and the basic problem is always the same, that even though they have run from their past troubles, they will always face a new one in the new place. And basically, it’s all the same. It’s about power and power and power. Too cliché. If the problems are actually different from the previous ones, I think I’m cool with it. The problem is they always made it the same with extra complications. That’s all. Allegiant is just the same as others. They ran away and arrived at this new place with these cool technologies—which I still don’t get how the hell they managed it—and there, they meet a new problem which basically the same problem that they have from the previous place. It was packaged differently but still, the bottom line is the same. I think the film is a little bit disappointing and definitely far from my expectations. If you like The Divergent Series because of Theo James, believe me, you won’t get disappointed at all. He was given more portion in this film including when he did his action scenes. I literally like this film because of Theo James and nothing less. The story is already a no from me but Theo James is definitely a yes!! Four is super loyal, super sweet, and super hot. Perfect combination. Okay, I know I kind of exaggerating, but seriously, he’s very handsome. You just can’t deny that fact. I don’t know about Tris in the book, but Tris is in the film is super lucky to have Four. Theo James’s character has become increasingly interesting. Unfortunately for Shailene Woodley, her character, Tris, has somehow become less interesting than before. How can she believe in someone else first rather than her own friends? Seriously, Tris. So, all things considered, I think this film is disappointing. I was expecting more of it. Then again, this is a dystopian film and I think a dystopian film is kind of the same. Though I have to admit that I did get more of Theo James and that’s the best thing about this film. I am waiting for Ascendant next year and I hope it won’t be disappointing again. I give The Divergent Series: Allegiant 7 out of 10 stars.